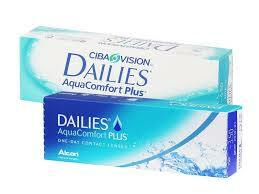 The most comfortable DAILIES® contact lens ever, with unique Triple Action Moisture. Research has shown that end of day comfort is still the biggest problem for contact lens wearers. Ciba Vision have addressed this problem by using the same ingredients found in artificial tears and rewetting drops - a compound called PVA, plus two other moisturising agents - and building these triple action moisturisers directly into the AquaComfort plus contact lenses.